Set to be released this autumn in line with the iPhone 6, Health is a lifestyle and medical app that collates your data into a single view. Though no release date for an iWatch is yet confirmed, its guaranteed that Health will be available across all devices compatible with iOS 8. One feature within Health, Medical ID could revolutionise the way we share information with healthcare professionals on the front line. Could it save our lives? Name and age – Important for identification. Medical Conditions – Summary of any conditions a paramedic needs to be aware of. Medical Notes – could use this to display contact numbers in case of an emergency. Allergies and Reaction – essential for a health care professional to be aware of this. You may be experiencing an allergic reaction which they can treat. Alternatively it may suggest certain medications they can’t administer to you. Medications – What you’re currently or historically have taken. May correlate with the reason you’re in an emergency, or may suggest what a paramedic needs to give you. Imagine you become unconscious during exercise. The medics find you and will check your wallet or phone for an identity. On your iPhone lock screen, a professional can see your Medical ID without having to unlock the device. This tells them your name and date of birth which makes it easier to obtain your full records at the hospital. 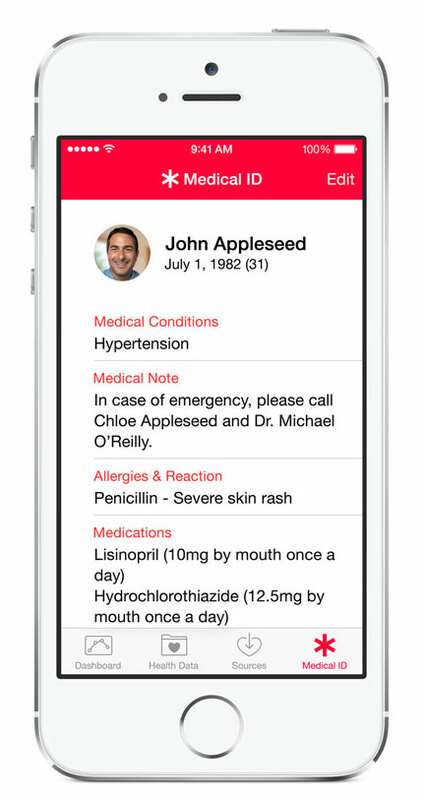 In seconds of viewing the Medical ID page, the paramedic can read an overview of your medical history including any medications you already take and any allergies you may have. All without the need of waiting for your medical records to be sent over. Saving time on decision making and allowing action to be taken sooner. And by putting your in case of emergency contact numbers within the notes section, the medical team can contact your close ones to alert them of the situation. They’ll be waiting for you at the hospital. Could Medical ID reduce error in hospitals? A recent study by James (2013) in the Journal of Patient Safety calculates American deaths associated with preventable harm could be anywhere between 210,000 and even up to 400,000 per year! Whether its an error due to misdiagnosis, miscommunication or even omission, there’s clearly too many errors occurring which could be fatal to the patient. Whether Apple’s Medical ID or a future app is the way forward, its clear that the greater access to a patients health data via a mobile device could help reduce error. Professionals making decisions are under a lot of pressure to get it right; ensuring the information is accurate and reliable within time sensitive moments, could help to reduce human error. There are other parts within the Health app which professionals could soon rely on. Health lets you select which information to share with specific apps. If you’re collating heart rate, you could send this to an app managed by your clinic. Your doctor could build up a profile of your healthy activity and recognise anomalies which you might fail to recognise. Rather than tell your doctor how you feel within a 10 minute appointment, the doctor can tell a story with the big data you present in the days leading up to your appointment. Could equipping professionals with in-depth stats allow a more effective diagnosis? Surely better decision making will help to save lives in the long run? Depending on how much we commit to transparency in our medical records, we could see a new era in the medical industry as a result of our wearable and mobile tech. Medical ID is just one of the features which will be available on iOS 8 devices from this autumn. Should an iWatch be released, expect to see it compatible with this information; ultimately allowing health care professionals to access our medical data straight from the wrist.